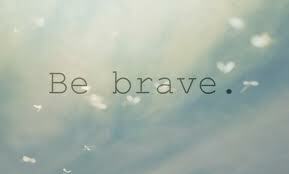 I Wanna See You BE Brave!! I woke up this morning with the song-I Wanna See You Be Brave in my spirit. I think many times we don’t have the things in life we want because we will not be brave and go get them. The Famous Willie Jolley says if you want to G-E-T just A-S-K!!! How many times have you not asked for what you want?? I know I can recall many times in my life, I stopped myself from asking because I wanted to be nice and not take something from someone else. Our first love should be God, and he encourages us to LOVE our neighbor as ourselves so that means love you enough to ask for what you desire. A no never hurts anyone. A closed mouth does not get feed. I learned this lesson in 2014, so going forward I will be BRAVE and I am asking you to do the same.